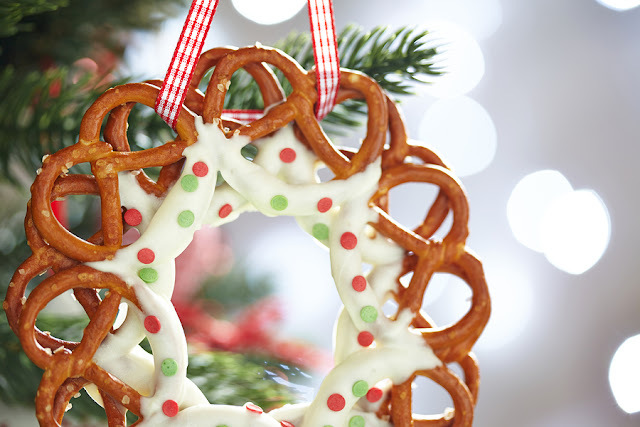 On a sheet of wax paper, layer pretzels into a wreath shape overlaying the pretzels on top of each other. Melt chocolate in 30 second intervals in a microwave safe dish. Stir after each interval until chocolate is completely melted. Pick up pretzels one at a time and dip the ends into the white melted chocolate. Place pretzel back in place creating a wreath. Work quickly so chocolate won't set while you are working. Add sprinkles to wet chocolate and let set. Tie a ribbon around the top when chocolate is set. Find more seasonal cooking ideas.